Write more than 5 sentences independently. Use full stops, capital letters correctly without reminders. Use speech marks and paragraphs correctly with limited support. Remember to elaborate and give detail without T reminder. To I asked my students (the whole class) to complete this Padlet, asking them what they wanted/needed to learn about for narrative writing. Along with these ideas from the students, I got them to write a sample narrative for me. The purpose of this was to see what they can do/what they remember. Use full stops and capital letters correctly without being reminded. 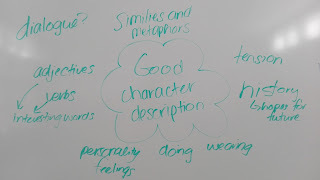 This week we focused on character and setting descriptions. 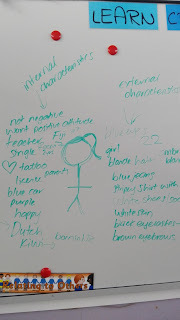 The goal was to get students to use descriptions beyond the physical/obvious. I gave them examples of boring and exciting descriptions, and then asked them to brainstorm what made a good description. Then they had to use those characteristics (things that make it 'good') to describe me, before going and doing a follow up task. 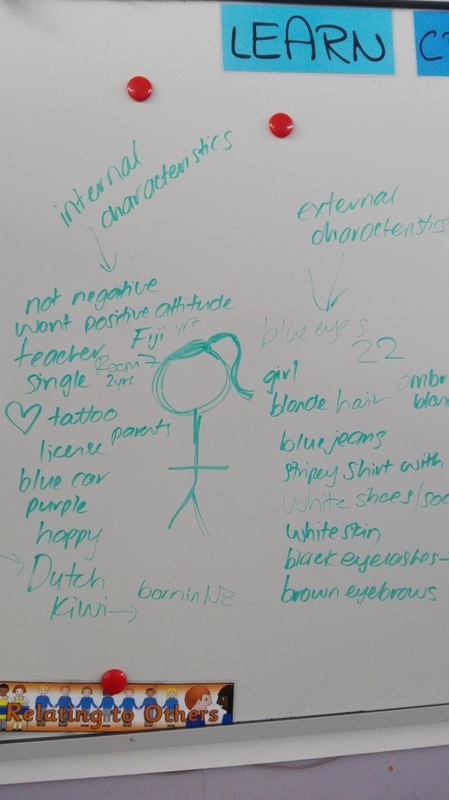 I strategically separated their descriptions of me into external and internal. The external side filled up quickly with very obvious physical characteristics (as per norm). I made them keep thinking until they could add the same amount of descriptions to the internal side. Encouraging students to give their characters a history I think got them thinking the most. In the follow up task, where students wrote 1 paragraph descriptions about a picture of a person, all of a sudden we had homeless children, abandoned grandparents, clowns and alcoholics. This week we focused on being able to write a short story quickly (not taking 2 hours, or worse) and then being able to give feedback to a buddy. The reasoning behind this was that students weren't critically reading their own stories, so hence weren't picking up their own mistakes. By having to give feedback to a buddy (with sentence starters provided), they had to look more deeply at the writing they were presented with. They also received feedback on their own work. My hope is that they would begin to independently check for the things they would receive feedback on and ensure they had them before saying 'finished Miss' and stopping the writing process. This week I tried to encourage the students to write faster, as they can take an hour to write a one page story. I gave them 30 minutes between morning tea and swimming to write a story about a given prompt. Most of the stories I got back were incomplete. On Wednesday, I gave the students as much time as they wanted to complete one really good narrative sample and I told them I would mark them as well. Here are the target groups samples (apart from Stanley, who was away again).